It's not a bug. Diameter is irrelevant, only mass matters when calculating orbit. Uh, true. The terra is 0.70992 and the main body is 0.89931. Close enough :P and the bodies are really close. I expect an HUGE amount of tidal forces there! Planets with highly elliptical orbit was deleted in 0.97? I didnt saw any in this version. I haven't seen any highly elliptical planetary orbits either. Are such planets an unrealistic feature? It's more that it doesn't work quite the way it should since SE doesn't simulate gravitational interactions. I found a strange crater today while exploring. It could be natural but I suspect aliens. Nope. 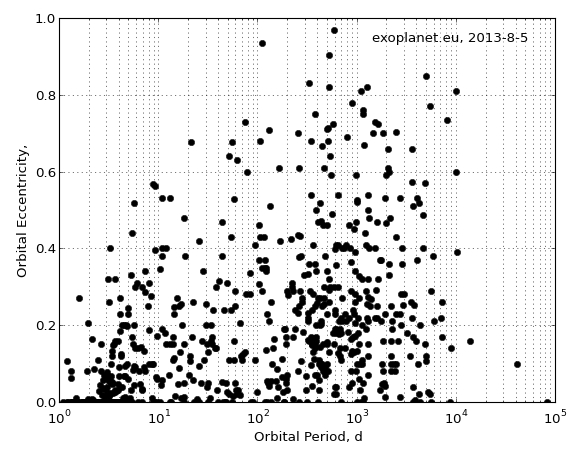 Planets with very elliptical orbits are actually quite common in the universe. If I recall rightly, SpaceEngineer removed them at least for now because it is hard to implement them properly -- causing planets to be on orbits that cross one another or pass through their host star. Although those scenarios can also happen, it would be much less common. Wow, that top planet has an eccentricity of about 0.95. That rivals that of comets. Yep, that's HD 20782 b, the most eccentric exoplanet known. Check it out in Space Engine, it's fantastic. Further conversation on this planet has been moved to the Astronomy Questions thread. I made a GIF of the movement of the terminator for the odd moon I found. As described in the "Challenge: The Quest for Earth's Twin" thread, this moon orbits its parent planet with an orbital inclination of about 104 degrees, while its parent has an orbital inclination of about 3 degrees in the opposite direction. This means that the moon's rotation direction is nearly perpendicular to the apparent motion of the sun around the moon (as viewed from a stationary point within the orbital plane of the moon- or more conveniently in the "follow" mode around the planet), and the moon's large orbital period compared to its parent (~1/6) means that the terminator rotates noticeably along two rotational axes. Do you have the location?